American game day snacks are, by in large, notoriously unhealthy. Comfort foods like nachos, chili dogs, and pizza may all be delicious and satisfying to chew on while your favorite team is on a winning streak (or maybe even more so when they can’t get their act together), but overindulging is often the last thing you want to do while you’re still hanging on to that New Year’s resolution to take better care of yourself. 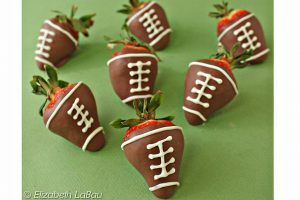 With a little creativity, you can make healthy snacks for whatever major football party you might be attending (or hosting), while still getting cheers for taste and presentation. Even from the people who blew their diets on January 2nd! 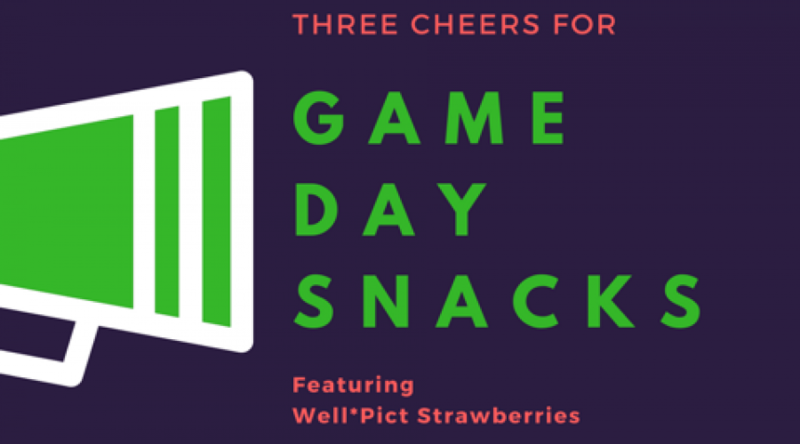 Here are some of our favorite game day recipes that utilize our champion berries. They’ll have you feeling like a winner regardless of how your team performs. Are you better at eating food than cooking it? This fun recipe for chocolate-dipped strawberries from Elizabeth Labau at The Spruce takes hardly any time and requires very few ingredients and little skill to master. What’s more, with a little food coloring and flavor alterations, you can swap out the football design and make baseballs, basketballs, or other balls instead. Get her recipe here. Tweaking a classic recipe is sometimes all you need to do to make something new and exciting for your tastebuds. 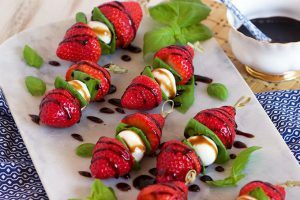 Kellie at The Surburban Soapbox had the right idea when she decided to “kick the tomato to the curb” and make caprese skewers with plump, juicy strawberries as a base instead. If you want to take the switch up even further, opt for goat cheese rounds instead of mozzarella (use dental floss as a hack for precise cutting), and substitute arugula for the basil. Get the recipe here. 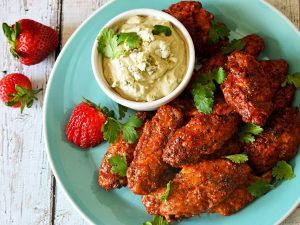 Hot wings are a common staple of the sports fanatic, and recipes for them can range from relatively healthy to a fried vehicle for excessive amounts of ranch and blue cheese. This version, from Morgan Eisenberg at Serious Eats, uses baking powder to crisp up the wings in the oven, rather than frying them. The strawberry/chipotle pepper blend in the sauce creates a winning combination of both sweet and spicy. Get the recipe here. This Well•Pict recipe is super easy but a total touchdown for your tastebuds. It takes three things already delicious on their own- brownies, strawberries, and frosting- and mixes them up for a first-string combination. That’s what we call teamwork! Feel free to substitute a gluten free box of brownie mix- it’ll make you be a hero to your guests with dietary restrictions. Hip, hip, hooray! Follow box recipe, and fill mini-muffin or tartlet pan cups ½ full. Rinse strawberries and pat dry. Slice strawberries horizontally; approximately ½ inch thick. For the White Butter Cream Frosting: Beat butter for a few minutes on medium speed. Add three cups of powdered sugar and beat on lowest speed until sugar has been incorporated into the butter. Increase mixer speed to medium, and add vanilla, salt, and two tablespoons of the milk/cream. Beat for three minutes. If frosting is too thin, add remaining sugar in increments. If too thick, add remaining milk/cream a tablespoon at a time. Slice brownies lengthwise to resemble a hamburger bun. Frost both sides of the “bun,” place Well•Pict Strawberry slice on bottom bun, and top with other. Add a dollop of frosting to the top and enjoy this sweet twist on a classic! There you go! Any of these recipes should earn you fans at your next game day get together. 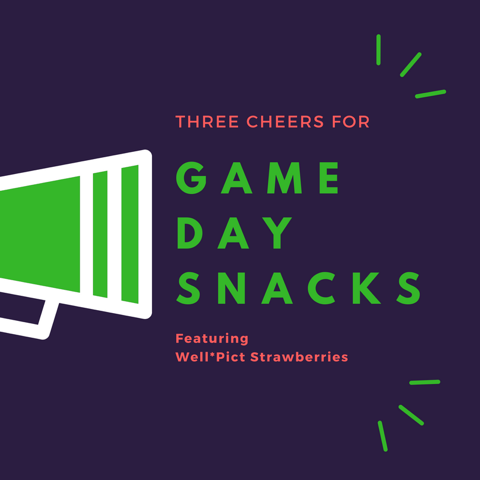 What are some of your favorite healthy game day snacks? Do you know of any other classic recipes that taste better when main ingredients are swapped out for strawberries? Let us know in the comments!